According to an email from RI Dept. of Environmental Management environmental scientist Mark Dennen, "85% of soils have been placed to reach the goals of the closure project" at the former Island Park landfill. 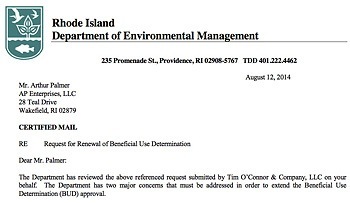 The firm doing capping work in Island Park, AP Enterprise, has received permission from the Coastal Management Resources Council (CRMC) for several exploratory excavation sites to determine the boundary of the former Town landfill, according to an e-mail sent today by the RI Dept. of Environmental Management (RIDEM). 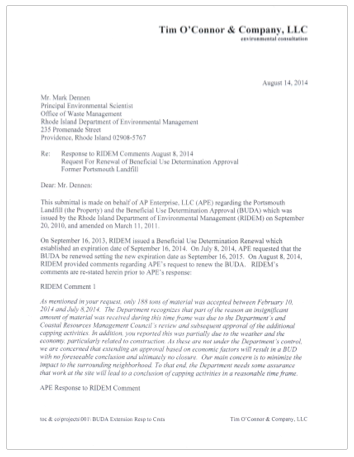 RIDEM Principal Scientist Mark Dennen said in the e-mail, "The owner has applied for and received permission from the Coastal Resource Management Council (attached) to perform exploratory test pitting in the northwestern portion of the landfill. This will allow them to more precisely delineate the areas of historic waste deposition, so that they meet cover requirements." Here are the documents provided by RIDEM: CRMC approval (139K pdf), CRMC Submission (3.4mb pdf). 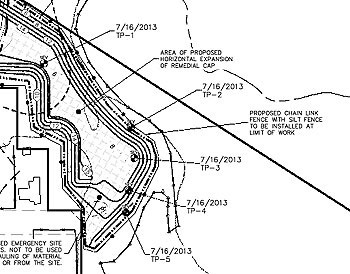 Editorial note: The torch-and-pitchfork crowd will undoubtedly begin screaming on Patch and their Facebook group that this is an blatant attempt to expand the capping zone and truck in more highly profitable toxic dirt. But if the purpose of the capping project is to, well, *cap* the area containing toxic landfill, this step would seem to make sense. At least it must have seemed that way to the CRMC and DEM, or they wouldn't have approved it. Of course, if you believe they're in the pocket of the developer (and the aliens in the black helicopters), well, then, all bets are off. Landfill site worker power washing truck tires, 8:15am April 8, 2013. Responding to "a Portsmouth resident," freshman Town Council member David Gleason filed a complaint on March 19 with the RI Dept. 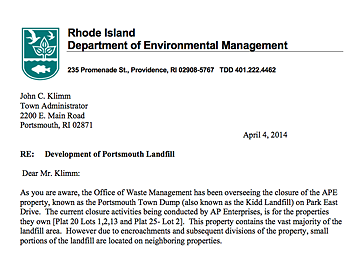 of Environmental Management (RIDEM) over activities at the Island Park landfill capping site where, he alleged, "contaminated dirt is blown around in a violent dust cloud," according to a copy of his e-mail posted on RIDEM's Portsmouth Town Dump Bulletin Board. I received a call this morning from a Portsmouth resident concerning the proliferation of airborne contaminated soil on Park Ave and Boyd's Lane in Portsmouth, RI. 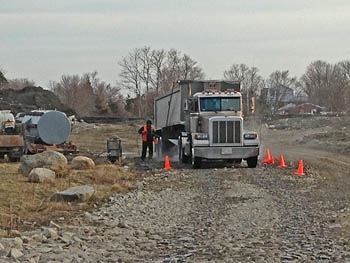 from trucks leaving the site of the "old Portsmouth dump site" which is being filled by or for Palmer Industries. In seeing this for myself today, there was also a police officer there today that took several photos confirming the tracking of large amounts of mud on, what I think are state owned roads. In addition, another resident filmed the conditions there yesterday as the dry, contaminated dirt is blown around in a violent dust cloud. No resident of any part of RI should have this occurring in their neighborhood and with the only two people in DEM's compliance division unavailable to speak with today, I am sending this email. While we in Portsmouth may not be able to change the situation that DEM is allowing here where contaminants are being brought in to cover this dump site, we can ask that the terms of the BUD(?) be adhered to. Allowing this much contaminated soil onto the roadways and into the air of our neighborhoods is unacceptable if not illegal. Please look into this matter at your earliest convenience! In passing on the citizen's observations, gravity feeding water from a tank into a puddle (of contaminated mud) to "clean" the truck tires leaving the site does not work. He suggested a gas powered pressure washer to clean the tires as a possible solution which I would agree with. It has also been suggested to me that contaminated soil is being used as "cover" on contaminated fill. This too should be investigated by DEM. Perhaps we all have become too complacent at this site and it requires more oversight by DEM for our resident's safety and health. Thanks in advance for your remedies to this situation. David Gleason Portsmouth RI resident and Councilman (401-524-7660). Let's just notice Gleason's language for a moment. "Proliferation of airborne contaminated soil," "contaminated dirt," "contaminants being brought in," "contaminated mud," and, finally, alleging that "contaminated soil is being used as 'cover' on contaminated fill." Replacement of stone at the entrance. On Tuesday, March 26, 2013 two DEM inspectors revisited the site. They found the three measure described had been implemented. They also observed that there was not a noticeable buildup of soil in the street. Trucks were not present at the time of inspection although earth moving equipment was operating at the site. At the time, the soil being managed was relatively wet and a dust problem was not observed. Sampling results were requested and received for the soils that were being managed onsite. The Project Manager (David Peter) indicated that one of the sources met residential standards while the other two met commercial/industrial standards as required by the BUD. The Department has requested and is reviewing the sampling results. Reached for comment by harddeadlines, Mark Dennen, RIDEM's Principal Environmental Scientist, noted that they had taken action as soon as the complaint was filed. "We made APE [Arthur Palmer Enterprise] aware of the complaint the day it was received (3/19/2013)," said Dennen. 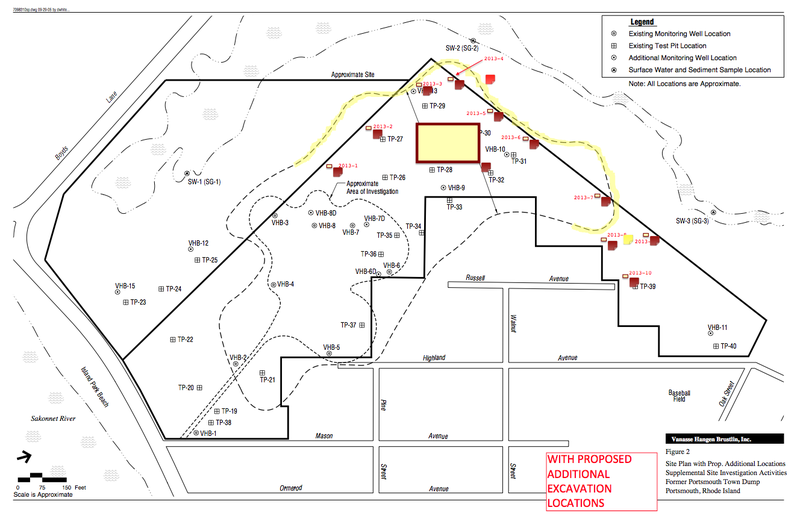 "A RIDEM inspector visited the site on 3/22/2013 and made suggestions to address the issue. On Monday (3/25/2013), APE sent us photographs to show that they had instituted the recommendations. 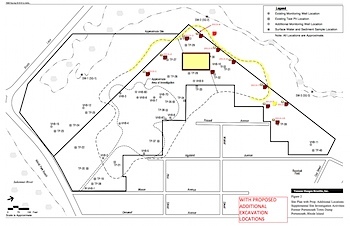 On Tuesday 3/26/2013, a site inspection by the Department confirmed the issues had been addressed." This morning, when this reporter passed the landfill (two blocks from my home) I snapped the picture above of a site worker washing mud off the tires of one of the soil delivery trucks, and personally observed from the condition of Park Avenue that the process seems pretty effective. What about all that "contamination?" Said Dennen, "[T]he Department requested analytical data for the material involved. We received and posted over 500 pages of analytical data for this material. The sampling results show that the material involved all met the criteria in the BUD." Dennen's laconic summary: "What we observed was a nuisance created by the mud on the road." Took me a while to post this because I had to go through the entire 535 pages of soil analysis. And unless you believe that testing labs are faking results, that licensed professionals are signing off on fabricated documents, and that everyone is willing to risk their reputations and livelihood in an intricate, wide-spread coverup, then the collective weight of the evidence does not support the descriptions of contamination offered by Mr. Gleason. While no match for the RIDEM-bashing of prior Town Council President Joe Robicheau, newbie David Gleason, appears, to this reporter, willing to take up the cause of the anti-arsenic crusaders. 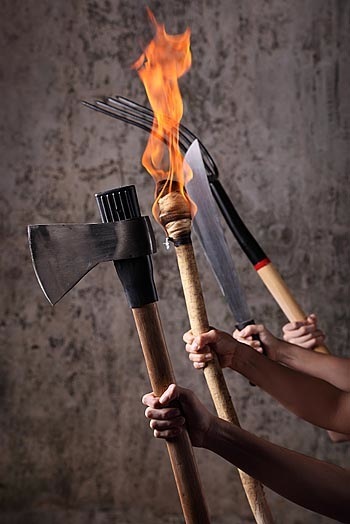 The torch (and pitchfork) have been passed to a new generation. Links: Sampling results (13mb pdf), March 28 RIDEM Field Investigation Report (687k PDF). 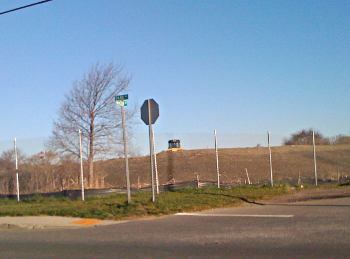 Full disclosure: I live in Island Park, two blocks from the landfill site. 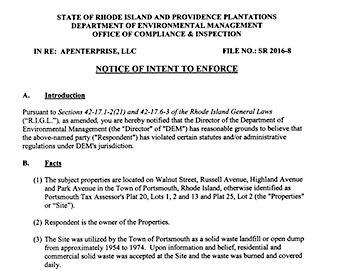 The RI Department of Environmental Management has renewed the permit for AP Enterprise (APE) to continue work capping the former Island Park dump for another year, according to an e-mail sent to interested parties this morning by RIDEM environmental scientist Mark Dennen. 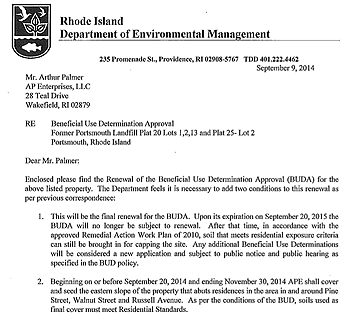 The document, called a "Beneficial Use Determination (BUD)," spells out the conditions for the site cleanup. DEM promised to post it on their web site, or you can download it here. As of this date, the grading and shaping activities, as well as placement of cover material has been in compliance with the BUDA. However, less than half of the site has been covered. A significant factor in this delay, as outlined in the renewal application, is that truck traffic is restricted over the Sakonnet River Bridge due to ongoing repairs that were originally anticipated to be done early in 2012 but is still ongoing. According to Dennen's e-mail, "[T]here are no changes from previous conditions except that a condition was added to give the Department access when APE employees are not onsite." Full disclosure: The great thing about science is that stuff is true whether you believe it or not. Governor's office says landfill opponents exhibit "a pattern of unsubstantiated allegations"
Ryan Crowley, constituent liaison for Gov. Lincoln Chafee, responded "directly on his behalf" by e-mail this afternoon to my letter about the behavior of opponents of Portsmouth's Island Park landfill capping project — printed this week in the Newport Daily News, Sakonnet Times, Portsmouth Patch, and RI Future. Regarding the public behavior of the protesters, Crowley responded that DEM was not present during the event at the landfill, but, "at a public meeting earlier that year, individuals from the Department felt the conduct of the opponents was threatening enough that Portsmouth Police were called in at their request." And on the matter of the complaints the group keeps lobbing at DEM, Crowley said, "you quite accurately note that there is clearly a pattern [of] unsubstantiated allegations. According to DEM the latest allegation involved a claim that soil was highly contaminated with lead coming from a school in Fall River to the project. When DEM researched the complaint, the City Official quoted denied making any such statement about lead in soil. Both third party sampling and the DEM's own confirmation sampling showed there were no exceedences of lead in any of the soils. DEM says this is an illustrative example of the unsubstantiated complaints received over the course of this project." Editorial note: A big thank you to Gov. Chafee. It makes me feel better that the torch and pitchfork crowd aren't the only people who get his attention. Thank you, sir. 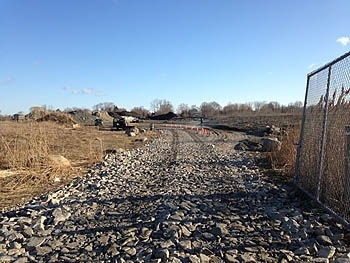 Today's GoLocalProv has a story about the nearly one hundred abandoned landfill sites in Rhode Island, and if Portsmouth's Sen. Chris Ottiano (R-11) has has way, capping them could get a lot harder. Here's the problem: What constitutes "need" -- at least in the case of a landfill in the town of Portsmouth -- is a group (whose spokesperson is a RISC board member) which has, over the past year, ignored the science, distorted facts on a petition, refused to trust test results or the DEM, and used political pressure to try to halt a project to cap an unquestionably contaminated site. These are the voices that Sen. Ottiano's torch-and-pitchfork bill would empower. In March, 2011, a group of protestors wearing respirators and Tyvek suits surrounded my 11-year-old son on Park Ave. "If you think the landfill is safe," they said, "Maybe we should throw you in there." Although I was just feet away, I couldn't hear this. I was also surrounded by people shouting and waving signs to keep Mario Hilario from interviewing me about scientifically established safe levels of arsenic. This, after a Patch reporter caught a protester on video yelling in my face, prompting a call to the Portsmouth police. Such is the character of the people opposing the landfill capping work in Island Park: they threaten children and shout down those who try to communicate facts. I have a thick skin, but my son was traumatized. Over the past year, they lobbed dozens of accusations at the Rhode Island Department of Environmental Management (RIDEM) -- documented on a RIDEM web site http://www.dem.ri.gov/programs/benviron/waste/portsmouthlf.htm -- but none of their paranoid speculations have survived contact with reality. When you read the RIDEM responses, you find phrases like, "The characterization that the Department chose between the Commission and Dr. Vanderslice is not accurate," and, "These assumptions are completely inconsistent with the Regulations, the Commission's recommendations or actual site conditions," and, pointedly, "As is frequently the case on meetings about controversial topics, recollections and interpretations about what was said, as well as speculation on the motives of the participants, are frequently at odds. At this point, the Department feels it has reached the point where it should simply be recognized that the commenters' recollection and interpretations of what was said are at odds with the Department's participants." That last one is about as close as a public official ever gets to telling someone they are flat-out lying. But the opponents have little choice, because the facts are inconvenient. Batches of soil brought in over the past month were tested -- http://www.dem.ri.gov/programs/benviron/waste/pdf/pl0212rs.pdf -- and tested again in response to yet another baseless complaint. Levels of arsenic and lead were well below residential limits. http://www.torvex.com/jmcdaid/files/plf fr sampling final report.pdf. It is time for elected officials to stop pandering to the uninformed and misinformed: This group had a meeting with the Governor arranged, had their questions answered personally by the RIDEM Director, and had state legislators representing their point of view at Town Council meetings. Enough. It's time for our legislators to stick up for the facts and the good of our community. And it's time for them to stick up for my son. The Portsmouth Town Council has a full bracket of PCC-sponsored mayhem on Monday, and I would urge all citizens interested in respect for science, medicine, and the right of our children to play as they wish in our public parks to attend. Under old business, Paul "Transparancy" Kesson has an agenda item to "request that the Council Direct the Town Solicitor to prepare and ordinance limiting contaminates in fill material to the levels existing on land to be filled." Yes, the Council clearly knows better than the RI DEM, the Federal government, and the international scientific community about safe levels of arsenic. If you care about science, the right to use compost, or our taxes (see my previous posts) you'll want to encourage the Council to think long and hard about this one. Okay, well, maybe just think long. Then, former PCC director "Cheshire" Kathy Melvin has requested an agenda item, "Request Council Involvement in Approval Process for Locating Marijuana Center in Portsmouth Industrial Park." While I suppose it's possible that Ms. Melvin wants to urge the Council to speed the process along to get medical relief to those who need it, my gut tells me that's not what's going to be requested. Where were Ms. Melvin and the Council when CVS and RiteAid were stocking store shelves in our town with oxycodone? I'm shocked. Shocked, I say. And to round out the trifecta of wacky, Portsmouth Police Chief Lance Hebert has an item, "Request Council Direction on how to Proceed re: Signage - Skateboarding at Island Park Playground/Police Dept." If you've read the coverage in Patch, you'll know that a new sign banning skating appeared in the Island Park playground, and my guess is that the Chief is going to ask the Council for an ordinance to back it up. Journalists are always looking for hidden connections, and while correlation is not causality, the fact that some of the most vocal landfill wingnuts are also the core of the anti-skate crowd makes me go, "hmmm." Not that the drumbeat of "who approved the aresenic" rhetoric about Town Administrator Bob Driscoll could have scared him into putting up a no-skating sign. I would never believe that. Nope. Not me. Remember that Descartes fundamental axiom is more properly stated as Dubito ergo sum, which makes much more sense when you think about it. I'll admit, I haven't been going to Council meetings. Given the 4-member PCC bloc, it just hasn't seemed worth trying to reason with them. But these are issues that touch everyone in the community, and even if they're intent on corkscrewing Portsmouth into the ground, I think they should hear from us. Hope to see you there. Full disclosure: I was a member of the Island Park working group that attempted to find a mediated solution on the skate park, and I was on the side of the skaters. Today's arsenic fact is the DEM's discussion of the nightmare hurricane/flooding scenarios advanced by opponents of the project. Here's what the DEM said in the Beneficial Use Determination (BUD), available on the DEM web site. There have been comments of concern that by creating this large mound of soil, it will lead to catastrophic consequences for the neighborhood in the event of a hurricane. Furthermore, the claim is that the slope will worsen a hurricane impact by its physical presence. The Department's disaster debris coordinator was also part of the review team for this application. We have also discussed the issue with the Rhode Island Emergency Management Agency. The drainage plans for the proposed work have undergone extensive review and received approvals from CRMC, the Town of Portsmouth, as well as DEM. Storm event and drainage calculations are required a part of these reviews. As it is within the 100 year coastal flood plain, the tidal surge of a category 3 hurricane could be devastating for the residents of the area. Even if the landfill did not exist, the catastrophic wind and flooding from such an event could result in the release of a large volume of other hazardous materials to the area; oil (from heating oil tanks), gasoline (from cars, mowers, boats and gas cans) and household chemicals (pesticides, herbicides, paints, and cleaners). Based on the technical review, a 3-5% slope on the landfill will not make a discernable difference to the flooding pattern associated with such an event. Furthermore, having a cap on the landfill, as compared to its current condition, would lessen the effects of a hurricane spreading contamination that already exists at the site.